Personality: A set of individual attributes that consistently differentiate persons from each other in the ways they think, feel, and act. 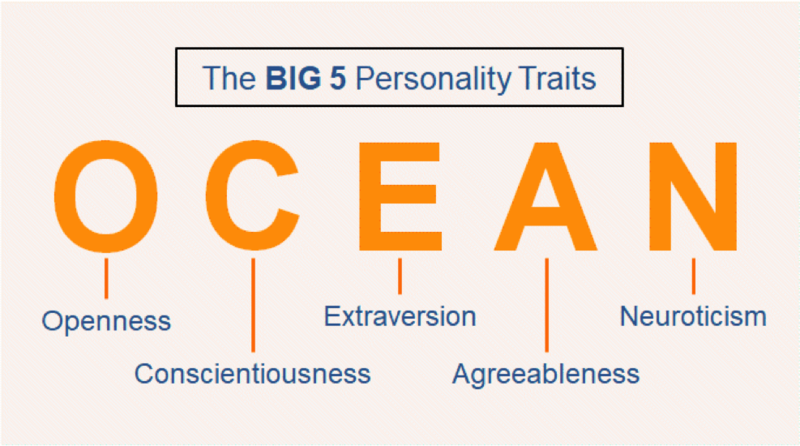 The “big five” are broad categories of personality traits. They represent the most widely used model for generally describing how a person engages with the world. 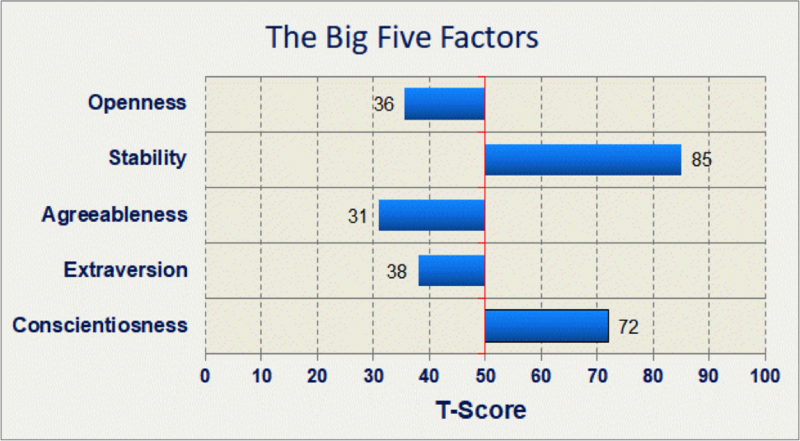 The “Big Five” are broad categories of personality traits. These are not “types” of personalities, but dimensions of personality. So someone’s personality is the combination of each of their Big Five personality characteristics. It is important to note that each of the five personality factors represents a range between two extremes. Personality traits are generally considered to be relatively constant over the course of time. It is therefore wiser to look at the traits that you have and how they can be used to your advantage than to try to change a trait. A certain trait that is less desirable in some situations can be highly advantageous in another situation, work or otherwise. The challenge is to find a hobby, study, job, and work environment that is the best suited to your personality. The better the fit between your environment and your personality, the more at ease you will be and the better you will feel. This can be translated into happiness, success or pleasant relationships with others. Agreeablenessis a person’s tendency to be compassionate and cooperative toward others. Conscientiousnessis a person’s tendency to act in an organised or thoughtful way. Extraversionis a person’s tendency to seek stimulation in the company of others. Emotional Stability, also referred to as Neuroticism or Natural reactions, is the extent to which a person’s emotions are sensitive to the person’s environment. Opennessis the extent to which a person is open to experiencing different activities. Each factor consists of a cluster of more specific traits that correlate together. These traits can somewhat predict a person’s workplace social behaviour and performance. The Big 5 Personality Traits are easily remembered by the acronym OCEAN. When you know your personality, you can learn about what your type usually likes or dislikes. You might thus discover new interests by trying out the untried things in the list and avoid situations that you are likely to dislike. Personality types also help choose careers. 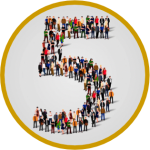 Knowing how the Big Five personality traits influence effective leadership could save organisations time and financial resources in the areas of leader selection and performance. 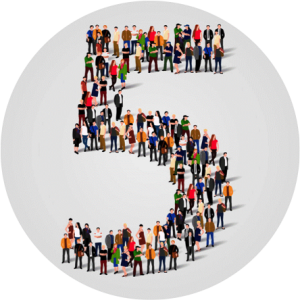 The Big Five traits can predict a person’s workplace social behaviour and performance. Having a deeper understanding of these behaviours can help co-workers and managers create trust, better relate to one another and cultivate a stronger workplace culture. In the selection of employees, whether for new employment or for new deployment, the full-facet profile can capture the unique trait composition of a specific job. For some jobs, no unique traits emerge–in other words, the scores of a sample of incumbents in that job average out the same as the general population. But many jobs are characterized by unique trait scores–scores which differ substantially from the normal population. In this latter case, one can compare an individual’s scores to the job’s scores and therefore determine the degree of fit between the individual and the job. In a team building session using the Big Five Profile, participants will learn about themselves, their teammates, and how to improve communication and teamwork with others including customers, vendors, etc. In a leadership development session using the Big Five Profile, participants will learn about their personality profile and how it relates to the typical leader profile. When you combine personality traits with performance information, then one can capitalize on strengths and determine where training will be effective and where compensating strategies are required. 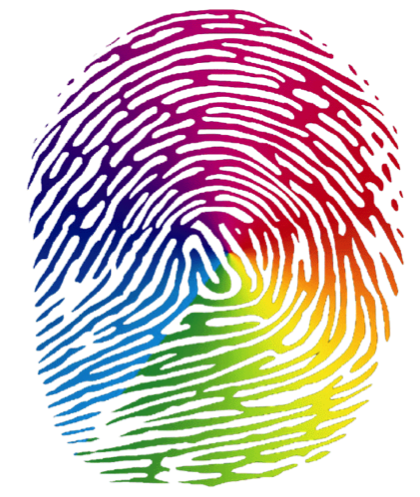 Using the Big Five Profile, companies can define a target profile for a specific job, then assess candidates against it. This is one of the steps to take in the selection process along with critical behavior interviewing, reference checks, IQ testing and more. Your scores on the personality factors are compared with the scores of a general norm group. The scores are expressed in T-scores. A T score of 50 represents the mean of the norm group. Approximately 7% of the norm group have a T-score lower than 35. And 7% have a T-score of 65 or higher.